Home / Stock Picks / Hot Stocks / Should You Buy Nvidia (NVDA) Stock Right Now? Shares of Nvidia (NASDAQ:NVDA) surged 2.49% Thursday on the back of continued speculation that the chipmaker will release the much-anticipated update to its GeForce GPU line, sooner than later. Now the question for investors is should they consider buying NVDA stock now, ahead of any official GeForce announcement. Brand new reports surfaced on Thursday that suggested that Nvidia is stockpiling roughly one million GeForce GTX 11s in order to meet the demand for a Q3 or Q4 2018 launch. “It has been two years since the Pascal-based GeForce GTX 10 Series landed, so there is pent-up demand for this family’s successor to fuel the 4K gaming craze,” Hot Hardware’s Brandon Hill wrote. A new GeForce line would help create even more demand for Nvidia’s widely popular graphics cards that help fuel the video gaming industry. The success of the company’s GeForce GTX 11 line will be hugely important for Nvidia because, despite the growth of its other segments, its Gaming division is still by far the company’s biggest revenue generator. Last quarter, Nvidia’s Gaming revenues skyrocketed 68% to hit $1.72 billion, accounting for roughly 54% of the company’s $3.21 billion in total Q1 revenues. Investors will also be pleased to note that Nvidia’s Datacenter revenue soared 71% to $701 million, while Automotive revenues climbed by just 4% to $145 million. Nvidia’s massive year-over-year revenue growth is what has driven shares of NVDA up so high over the last few years. In fact, Nvidia has seen its stock price climb roughly 1,100% over the last three years, which destroys the S&P 500’s 31% growth, as well as Amazon’s (NASDAQ:AMZN) 290% climb and Netflix’s (NASDAQ:NFLX) 321% surge. Investors will note that over the last two years Nvidia stock has continued to skyrocket. 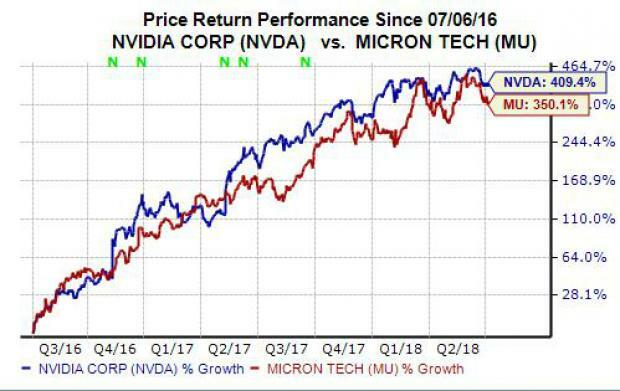 With that said, shares of fellow semiconductor powerhouse Micron (NASDAQ:MU) have outpaced Nvidia over the last year, up 75% compared to NVDA’s 69% climb. It is also worth pointing out that NVDA stock currently sits roughly 10% below its 52-week high. Nvidia’s impressive run hasn’t stretched the company’s valuation picture as much as some might assume. 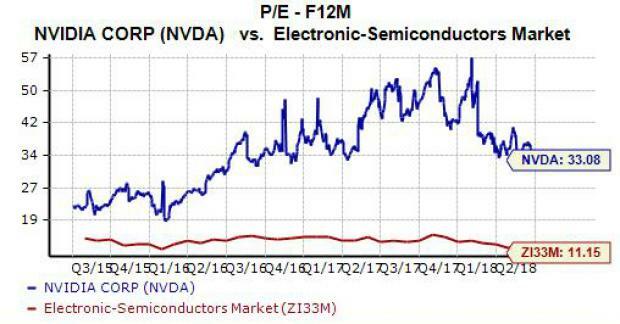 NVDA is trading at 33.1X forward 12-month Zacks Consensus EPS estimates at the moment, which marks a significant premium compared to its industry’s 11.2X average—this industry includes the likes of Intel (NASDAQ:INTC), Advanced Micro Devices (NASDAQ:AMD), and Texas Instruments (NASDAQ:TXN). Diving a little deeper, Nvidia stock has traded as high as 57.4X over the last year, with a one-year median of 44X. NVDA is currently trading just above its year-long low of 32.9X. Therefore, investors should be able to say with some confidence that Nvidia stock is hardly expensive and it might even appear relatively attractive at its current level. Our current Zacks Consensus Estimates are calling for Nvidia second-quarter revenues to climb by roughly 39% to hit $3.11 billion. For the full-year, Nvidia’s revenues are expected to surge nearly 36% to touch $13.18 billion. Moving on, Nvidia looks as though it is set to post much bigger profits this year, with its adjusted Q2 earnings expected to expand by over 81% to touch $1.83 per share. Meanwhile, its full-year ESP figure is projected to reach $7.93 per share, which would mark a 61% surge. Nvidia is currently a Zacks Rank #1 (Strong Buy) stocks and sports an “A” grade for Growth in our Style Scores system. NVDA has also earned 11 upward earnings estimate revisions for Q2, against zero downward changes, all within the last 60 days. More importantly, during this same timeframe, Nvidia has received 12 earnings estimate revisions, with 100% agreement to the upside, for both its current fiscal year as well as the following year. Nvidia’s solid forward P/E, top and bottom line growth projections, and its positive earnings estimate revision activity, coupled with what could be a major product launch all signal that now might be a great time to buy NVDA. 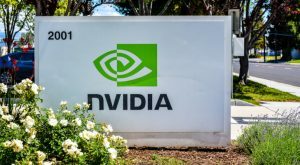 Article printed from InvestorPlace Media, https://investorplace.com/2018/07/buy-nvidia-nvda-stock-right-now-ggsyn/.